We’re all a little uncoordinated at times, but when you’re a hunk of metal hurling through space, the consequences are a bit more severe. This week, NASA’s Mars Atmosphere and Volatile EvolutioN (MAVEN), which has been orbiting the Red Planet for two years, had to perform a last-minute maneuver to avoid a disastrous collision with Mars’ moon, Phobos. NBD, though. On February 28th, MAVEN performed a rocket motor burn in order to increase its velocity by less than a mile an hour. The correction ensured that MAVEN would miss the meatball-looking-moon just in the nick of time, by about 2.5 minutes. Had NASA not ordered the maneuver, MAVEN could have smashed into the Martian moon on March 6th. This is the first time MAVEN has ever had to perform a maneuver of this kind to avoid Phobos. Fortunately, a team at NASA’s Jet Propulsion Laboratory in Pasadena, California meticulously monitors the spacecraft’s orbit in relation to Mars’ two moons precisely so that cosmic smashups can be avoided. “Kudos to the JPL navigation and tracking teams for watching out for possible collisions every day of the year, and to the MAVEN spacecraft team for carrying out the maneuver flawlessly,” MAVEN Principal Investigator Bruce Jakosky said in a press release. 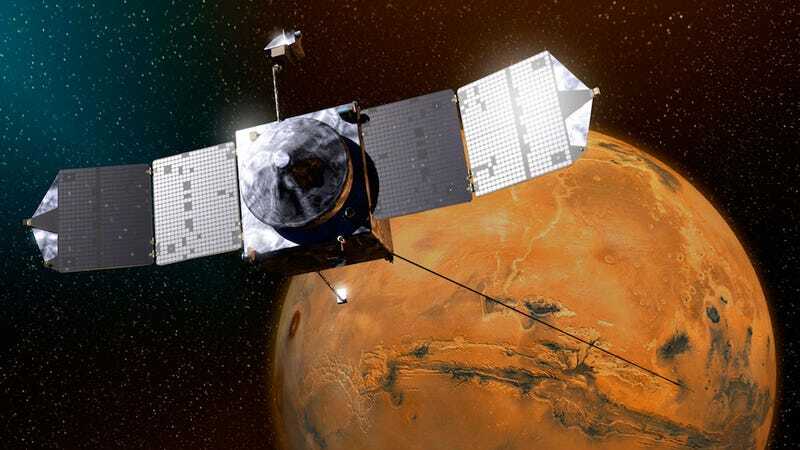 MAVEN, which launched in November 2013, has been spending its days studying Mars’ upper atmosphere, ionosphere, and interactions with solar wind, according to NASA. Hopefully, this brave little spacecraft can continue its work without clumsily crashing into another moon. That said, at the end of the day, Phobos is still screwed.